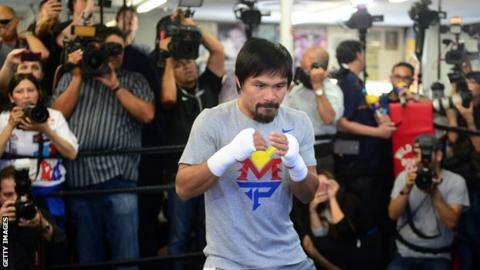 Manny Pacquiao says the timing is right for his long-awaited fight with American Floyd Mayweather. Mayweather, 38, and Pacquiao, 36, are considered two of the best fighters of their generation and the bout on 2 May is set to generate £162m ($250m). The contest has been more than five years in the making and critics have said the pair have left it too late. "It's a good thing it is happening now because more people are informed about it than before," Pacquiao said. Speaking at his open training session in Hollywood on Wednesday, the Filipino added: "What I feel right now is motivation, inspiration and determination. The killer instinct is there, I love it." Pacquiao's WBO belt and Mayweather's WBC and WBA welterweight titles will be on the line at the MGM Grand in Las Vegas. "Mayweather is going to be able to do all kind of things and I just can't see how Pacquiao is going to be able to hit him. I believe Mayweather is just going to be the better fighter all round. I think that Mayweather could knock Pacquiao out." And while Mayweather says it will be the penultimate fight of his career because he no longer enjoys the sport, Pacquiao's trainer Freddie Roach says his man is in the best shape of his life. "We've had a very good training camp. I've never seen Manny at this level," said Roach. "He's really motivated for this fight. It has really escalated his performance. I think he's faster than ever and he's definitely hitting harder than ever." Mayweather has a perfect record of 47-0 with 26 knockouts, while his opponent has 57 wins, five losses and two draws to his name. On Tuesday at his boxing club in Las Vegas, the American accused eight-division world champion Pacquiao of being a "reckless" fighter. But Roach said: "Manny is not reckless at all. Everything we do is planned out and it's part of the game plan. "Mayweather is a counter puncher and we have to attack really quick and get out really quick. We can't stay in the pocket too long. "We know how to beat this guy."